Above - Beekeeping for all ages! Image supplied by Raymond Huber. City life can distance people from nature and from the consequences of pollution and species decline. One solution is to bring nature to people's door-steps, such as bringing beehives into the city. Murray and Heidi Rixon rent beehives into home gardens. They visit the hives regularly and even teach their clients how to manage the bees. People can choose their degree of involvement with the hives and most are very keen to learn. 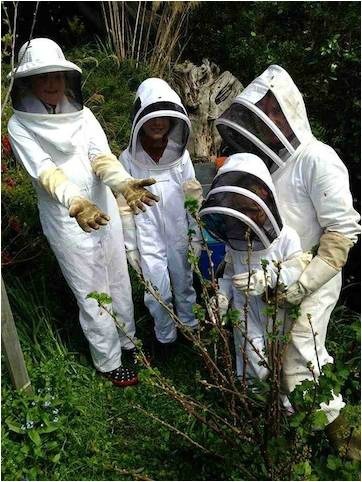 The Rixons provide protective bee suits for adults and children: "It's a great way of getting people keen on bees and not being fearful of them." Murray is a New Zealander who spent 20 years in the UK and worked in the Royal Botanic Gardens in Edinburgh. He met Heidi in Scotland and together they spent ten years creating a facility for one of the world's largest collections of rare macaws. They'd wanted to keep bees but the Scottish weather wasn't so great. Then they moved to Dunedin, New Zealand, and finally got into beekeeping - a very different kettle of fish to parrot-keeping: ''They don't shriek at you and don't require being fed from 5am to 11pm," Murray says. Murray and Heidi began their beehive rental business (www.rentahive.co.nz) after inviting a school class to visit their beehive: "We opened up a hive, with the class inside a shed looking out through windows. It was one of those moments that you realise you can offer something to people, to families, to children." They decided to expand the concept of beehive rental and encourage their clients to participate with hive management and honey extraction. They first assess a property to make sure it's suitable. Once the hive is in place they visit about six times a year, often more: "We have to manage colony size for suitability to domestic environments. We pride ourselves in ensuring that bees can be successfully managed to avoid neighbour concerns, swarms or nuisance." Murray is happy to work with people's varied approaches: for example, painting hives in different colours, or accommodating organic methods of Varroa control. "We encourage text conversations with our clients additional to email and ‘phone. Some of our clients, or their partners, have concerns. We think that it's wise to consider the risks. We speak plainly and consider all sides of beekeeping." 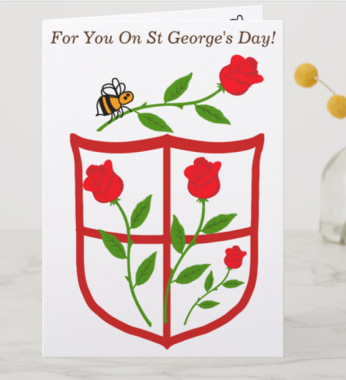 They say the Rentahive business has a ''massive feel-good factor'' because people are keen to learn and are driven by the urge to do something "positive and proactive" about the decline in bee populations. And naturally they are excited to get a share of the honey. Rentahive offers a boutique honey extraction service. "We extract and package for the domestic market. Your own honey to amaze friends and family!" 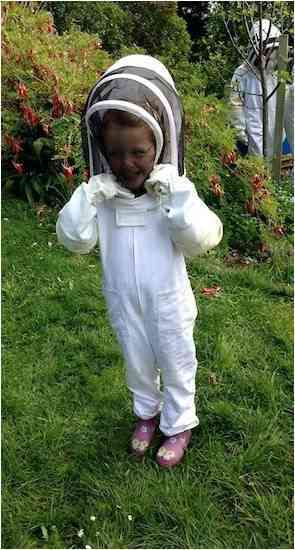 Above: Children can partake in beekeeping too! Image supplied by Raymond Huber. Murray and Heidi just expanded their concept further and launched a schools' project: "We take live, captive hives into classes and talk about bees. We then take a free-flying hive to within, or near to, a school and build a partnership with them. The kids can partake in the construction, help with care of the hive and undertake honey extraction. The school can also raise funds from honey sales." "Beehive rental is a wonderfully fulfilling business. Our clients are overjoyed with the process and it provides for a truly pleasurable manner of business for us." There are significant benefits from having beehives in an urban setting: bees get a longer flowering season and a wider variety of pollen/nectar sources; gardens are well-pollinated; honey flavours are unique; and best of all, people more fully engage with the environment. 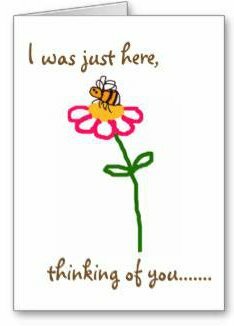 (Raymond Huber is an author of various children's books about bees).